Oscar Evans Jr. obituary. Carnes Funeral Home. 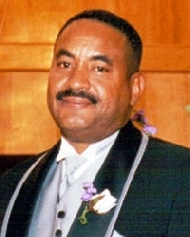 Oscar "Squeaky" Evans Jr, 56, passed away on Monday, March 30, 2015 at his home in Galveston, TX. He was born on November 23, 1958 in Galveston, TX to Oscar "Butch" and Jean Marie (Frenchwood) Evans. Oscar grew up in Galveston, TX and graduated from Ball High School with the class of 1977. After 25 years of service he retired from the Texas Department of Criminal Justice (TDCJ). Oscar was preceded in death by his parents. He leaves to cherish his legacy, his devoted wife, Sandra Denise Evans; daughter, Malisa Thomas (Kevin); sons, Oscar D. Evans (Denise) and Brent D. Evans (Lupe); the honeybees, Oscar Jr, Bre'Asia, Orhiana, Brent Jr, Jori and baby Kason; bonus grandchildren, Tavon, Daisha, Tea'; brothers, Bryon and Joel Wayne Evans (Keosha), sister/ loving aunt, Rita Bryant Woodard; devoted mother- in-law, Bobbie Wilson; aunts, Gertrude Johnson (James), Mary Janie Evans, Helen Pines, Beverly Brooks; uncle, Carl Galloway, devoted family friends, his loving nieces, nephews and numerous other relatives and friends. Visitation will be held at Shiloh AME Church 1310 29th St, Galveston, TX 77550 from 10:00 am -11:00 am on Saturday April 4, 2015. The funeral will begin at 11:00am at Shiloh and the burial will follow at Lakeview Cemetery Galveston, TX. The Repast will be held at Compton Memorial 2628 Ball Street Galveston, TX. Memorials may be sent to Carnes Funeral Home 3100 Gulf Freeway Texas City, TX 77591. Please light a candle of remembrance and leave a tribute for Oscar at http://www.carnesfuneralhome.com/oscar-evans-jr. Dorthea Jones with Carnes Funeral Home is the family Funeral Director.